Since 1975, global average surface air temperature has increased at a rate of 0.17 deg.C/decade (estimated by linear regression using either the NASA GISS or HadCRUT4 data sets). But the rate of increase hasn’t been perfectly constant over that entire time span. That 15-year time span covers the years 1992 through 2006, during which the rate of warming was 0.28 deg.C/decade. That’s a lot faster than the warming rate from 1975 to now. In recent years, a global network of automated buoys has offered a much-improved picture of what is going on below the surface in the ocean. These buoys automatically dive deep down into the ocean every day, taking temperature measurements as they slowly rise, and transmitting that data back to a central database via satellite. The figure below, via Argo, shows the location of buoys currently active in the world’s oceans. While measurements of deep-ocean temperatures existed further back in the past, they were taken only in limited locations until 1999, when Argo buoys were widely deployed. However, scientists for far longer have been able to use more limited data to reconstruct temperatures down to depths of 2,000 meters, as shown in the figure below. Total ocean heat content has increased by around 170 Zettajoules since 1970, and about 255 Zettajoulessince 1955. This increased temperature has caused the oceans (0-2,000 meters) to warm about 0.09 C over this period. As the UK’s Met Office points out, if the same amount of energy had gone into the lower atmosphere it would of caused about 36 C (nearly 65 degrees F) warming! The oceans are by far the largest heat sink for the Earth, absorbing the vast majority of extra heat trapped in the system by increasing concentrations of greenhouse gases. If you have not read them, take in Stefan Rahmstorf’s piece here, as well as another good one by Zeke Hausfather. And, of course, my latest video which should be sufficient to put down most denialist water-cooler climate experts in just a few minutes. Only Spm tomorrow , no? that is my understanding. the rest will dribble out over a year. IPCC not known for media savvy. Actually, the IPCC is very media savvy. It’s science savviness that they lack. right. that’s why we have you, Dave. I think only the WG1 report comes out tomorrow. It also says, “54677 COMMENTS,” but they haven’t released the experts’ comments yet, either. Hopefully they’ll be released with the WG1 report, on Monday. It appears that by dribbling it out in little pieces they hope to generate a steady stream of news stories. I’m sure it will, too. The IPCC is nothing if not media savvy. Temperatures are not measured in Joules. Also, by “reconstruct temperatures” I think you really mean “speculate about temperatures.” It is very unlikely that ocean heat content was really spiking during the frigid 1970s. The (resulting) increase in temperature…. I rather think a scientist of the calibre of Hausfather is aware that temperature is not heat, don’t you? His graph is nothing but speculation, and it’s inconsistent with the accompanying text. Look at that graph: it shows about 220 zettajoules increase from 1970 to present (increasing from about -40 to +180), but the text says the increase was only 170 zettajoules. It hardly matters, because both numbers are pure speculation. 43 years of precise ocean heat content numbers? Who does he think he’s kidding? In fact, he (and the Met Office) claim to have ocean heat content numbers back to 1955*! What a joke. 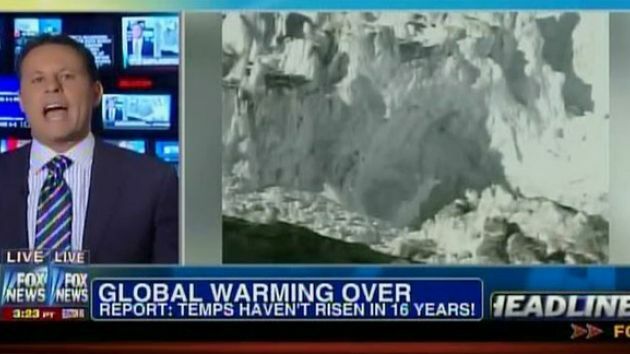 Like so much of the so-called “data” that underpins climate alarmism, it’s baseless nonsense. True that Zeke Hausfather’s discussion did not smoothly shift units between energy and temperature. He’d probably edit those two sentences if given the chance. However, that criticism is a tad picky given that the specific heat of water is well understood. I suspect that ocean heat accumulation and surface temperature changes are counter-cyclical. Is it plausible that ocean heat content increases more rapidly when air temperature decreases, and increases more slowly when air temperature is sharply higher, such as in 1998 El Nino event when an unusual amount of heat was released from the ocean? Charles, when you turn the stove temperature higher does your food cook more slowly, and when you reduce the flame does the food cook more quickly? No. El Niño events are associated with spikes in both air and water temperatures, not with air temperatures going up as water temperatures drop. In general, warmer air causes warmer water, and vice-versa, because the rate of heat transfer increases with increases in temperature difference. How f*****g dare anyone out there make fun of daveburton. After all he’s been through!! HE’S A HUMAN! (ah! ooh!) What you don’t realize is that daveburton is making you all this money and all you do is write a bunch of crap about him. He hasn’t performed on stage in years. His song is called “There is no sea level rise” for a reason because all you people want is MORE! MORE-MORE, MORE: MORE!. LEAVE HIM ALONE! You are lucky he even performed for you B******S! Gingerbaker, I know you’re trying to be funny, but please do not make up things I’ve never said, put them in quotes, and attribute them to me. Not even in jest. One problem is their tendency to ignore the comments they get from their experts. The purpose of soliciting experts’ comments on the FOD was supposedly to allow them to identify and correct errors, when writing the SOD. But the WG1 SOD contained many of the same errors which the FOD contained, despite those errors having been identified in experts’ FOD comments. In a few hours we’ll find out whether they also ignored our comments identifying errors in the SOD when they wrote the Final Draft. I hope not, but I’m pessimistic. Whoops, not a few hours, a few days.